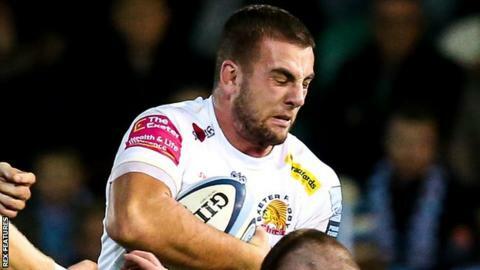 Sean Lonsdale is not a name that many outside of Exeter will have heard of, but this bright 21-year-old is fast becoming the next back-row star to come off the Chiefs production line. Having played just a couple of cup matches the flanker was thrust into Premiership action in December and has not looked back. "I'd think you were crazy," says Lonsdale when asked if he thought this chance would come when he was dual-registered at National One neighbours Plymouth Albion last season. "But I've been very fortunate to be honest. Even if it's just been covering injuries, I've been given some very special opportunities and thankfully I've made the most of them and been doing okay." The Manchester-born forward has gone from playing for Rygbi Gogledd Cymru (RGC) in the second tier of Welsh rugby to starting in a Premiership win against champions Saracens in the space of a little over two years. Five Premiership starts and another in the Champions Cup this season have seen him push out established back rows such Don Armand, Dave Ewers, Dave Dennis and Matt Kvesic. He is the latest on a production line of back rows at Sandy Park that have seen Tom Johnson, Sam Simmonds and Sam Skinner go on to win international honours with a crop of players like Lonsdale, Tom Lawday and Josh Caulfield coming through at the moment. "He's very much the quiet man of the team. He's a clever bloke and clever rugby player," Exeter forwards coach Rob Hunter told BBC Sport. "He is a stop tackler, so when he hits people they stay hit. "There's some understanding parts of the game that he needs to work on as he's an inexperienced young player and he's had a big season. "Last week he really took on board the feedback from the Gloucester game and he came on against Newcastle and made 11 tackles in 25 minutes and carry after carry after carry - there's no point having those skills if you don't put them on the pitch." As an England-born player with a Welsh mother he is eligible to play for both countries, but when asked who he was supporting last week when Wales took on England in the Six Nations, Lonsdale very diplomatically said "Exeter against Newcastle". He admits to shaking with nerves before he first pulled on an Exeter shirt in an Anglo-Welsh Cup match last season, but it is clear that the more Lonsdale plays the more confident he is becoming. "You realise it's just 15 men on the pitch," he added. "Blokes can only run so hard at each other, so it gives you that confidence to get into position early and running onto the ball you're pretty much set." And it appears his role as 'the quiet man' in the Exeter team is one that shouts loudly to the Chiefs coaching staff. "Sean does glue the team together a little bit and there's always places for those sort of guys who do just glue things together," Hunter said. "He makes the clearouts, he's a very high numbers player without necessarily always doing the stardust stuff. "He's a good line-out jumper, he's bigger and stronger than you think when you get close to him and he's quicker than you think. "He is very much the quiet guy in the background, but he does allow the people around him to play and I think he's gone about his season in a very low fuss way." And Lonsdale's ambitions for the months ahead? Well they are equally low-fuss. "Realistically it's trying to get a regular spot in the Chiefs team when there aren't so many injuries," he added. "Sam Skinner's a week off being fit, Sam Simmonds isn't far off, so I think that's the realistic challenge to get into the first team when there's international players available for selection, and that's what I'm going to try and push on with."